Man Admits He Doesn't Have A Bedside Preference & Twitter Has The Funniest Reaction! It's common knowledge that when you post an opinion on Twitter, a slew of comments and judgement is sure to follow. 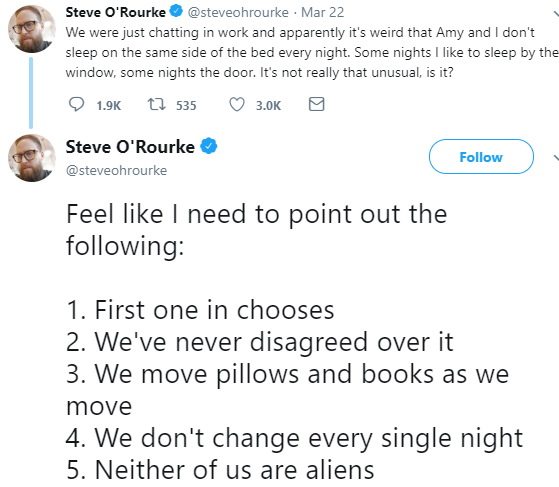 But little did Steve O'Rourke know that his indecisive nature about 'picking a side of the bed' would cause havoc on Twitter. And what he witnessed was nothing less than a descent into madness! 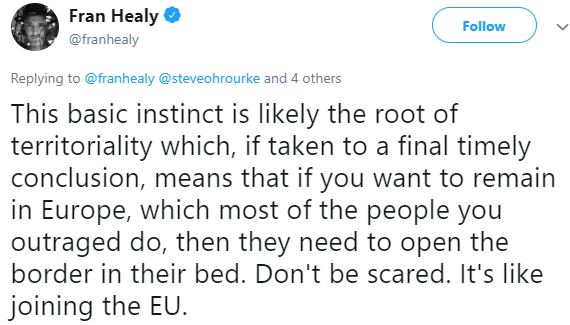 The Irish journalist tweeted to ask his followers if not having a specific side of the bed was unusual, after a debate with his colleagues. He wrote: "We were just chatting in work and apparently it’s weird that Amy and I don’t sleep on the same side of the bed every night." Ummm, Steve, how can you not have a preference? Picking a side of the bed matters. Yes, you read that right: the SIDE matters! And this isn't a baseless whim. According to a survey conducted on 2,000 adults in the UK about their sleeping habits, over 10% couples argue about which side of the bed to sleep on, and that one in 20 men are unhappy with the outcome of those arguments. There! We have statistics explaining why we're horrified by this confession. A majority of replies to Steve's tweets were that of absolute shock. I'm not watching that documentary. Yes, don't trespass. Respect the border. Yes, it's WRONG! Just absolutely not okay, okay? The disappointment couldn't have been worded more simply. Somebody needs to exorcise Steve The Demon! Now that's just equivalent to living on the edge, isn't it? So, I think we've established that Steve is 'not human'. Having a side is a universal phenomenon. Don't break down the social system, Steve! The Internet is a freak show! Sleeping is serious business, guys. Come on! After the Internet had cooled down, Stevie agreed that his wager was a lost cause. He admitted defeat and tweeted: "In 10 years and 50 odd thousand tweets, I've never regretted a single one until today 😬" Steve accepted and realized that he should have just kept his mouth shut. Now I understand Sheldon Cooper's obsession with his 'spot'.